The issue of rising greenhouse gas emissions has been occurring within large megacities across China as well as, New York, Tokyo and London. As urbanization has occurred at such a rapid pace around the world, human settlements have now become one of the major contributors to greenhouse gas emissions, and in particular metropolitan regions, are the hotspots for human activities and the main sources of greenhouse gas emissions (Minx et al., 2013). Environmental degradation in cities has long been an issue that both the public and private sectors have had to address. The invention and evolution of technology is something that has changed the way the humans live, work and play. It has changed almost every facet of our lives and plays an enormous role in shaping the way we interact with each other, but it has also changed the way we interact with the city we live in. The concept of a ‘smart city’ is a relatively new phenomena that has taken over the world in the past 20 years. Everyone from academic researchers and city governments to the business and tech elite have started coming up with new ways in which information communication technology (ICT) and big data can be utilized to help the city progress and become more efficient. Although a large body of work has been compiled on smart cities, there still lacks an overall definition of what a smart city is. Smart cities are those that are designed to help improve the efficiency and equity of cities without reducing the economic output. While the smart cities discourse has focused on a typology of the concept and comparison of city level plans, little empirical work has been conducted on the environmental performance of smart cities. 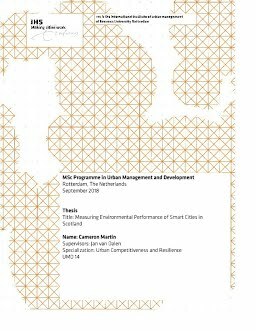 This study seeks to bridge that gap by exploring if smart city planning has had an impact of the environmental performance in terms of CO2 emissions of cities in Scotland from 2005 – 2016. This empirical research takes a combination of the largest authors contributions to smart cities research to create four pillars that represent the smart city and runs a spatial and statistical analysis on the data to see if there is a clustering of CO2 emissions and if smart city planning can have an impact on reducing emissions. Correlation analysis, Getis Ord hotspot analysis, Moran’s I, panel models and spatial panel models are conducted to explore the relationships. The study finds that CO2 emissions are clustered along the densely populated corridor between Glasgow and Edinburgh. This is likely attributed to the large amount of industry that occurs in the area as shown in the Getis Ord hot spot analysis. Statistically the results of the regression analysis show that with no spatial component included in the regression there is a very low likelihood that smart cities have impacted the reduction in CO2 emissions from 2005 to 2016. When the spatial component is included the impact that both technology, connectivity and specifically the presence of a smart agenda as smart city planning has on CO2 emissions is much stronger.